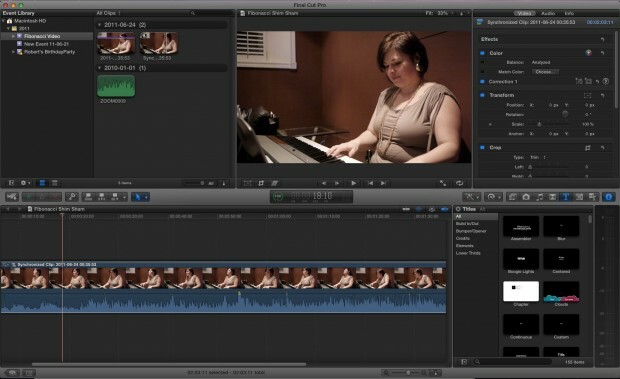 Apple recently released a new version of their popular movie editing software package Final Cut Pro X. As a former Final Cut Express user (and sometimes Final Cut Pro user), I love Final Cut Pro X. I don't have a tape based work flow. I shoot with a DSLR. I work by myself. I am not an expert or professional—I just love to tell stories. After taking a couple of days to get used to the new layout, I find the changes really let me fly. Everything is so much faster now without having to wait for things to render. With the new version the software mostly stays out of my way, leaving me time to craft a story. It has made making movies fun again. This is a definite step up compared to the (now discontinued) Final Cut Express. People using Final Cut Express and iMovie will find a lot here to like. The new interface is much simpler to use. This is a solid foundation on which Apple can build on in the future. Much of the power has been harnessed in a way that allows complex things to be easily accomplished. For the most part I like the magnetic timeline; it makes simple cuts quick to achieve. The new trim tool is also cleverly done. Audio managmenent within the program is also much better. I like that the magnetic timeline can be switched off to restore an older style workflow if needed (just select the P icon for place). The new audio sync is also handy. I used to do all of my audio syncing by hand using a clap or some other sharp noise. It wasn't that difficult to do, but it does take some time. Now it is almost instantaneous. Working with the AVCHD files from my Panasonic GH1 (hacked) is also much easier. There is no need to transcode the files (although more background rendering seems to be needed). I can still skim and edit the native footage without slowdowns. Even better, while the footage is being imported and I can work directly with the files on my memory card. Adding text also seems much simpler and less cumbersome than with the old Final Cut (notwithstanding Conan's video editor's experience). This is a tool that is so much faster and easier to work with. There are some frustrating things I have encountered. Some of the transitions and text effects are buggy and don't always render correctly. There are occasional crashes. The documentation is spartan at best. It took me hours to figure out that you cannot use an external time machine volume to store events. Luckily I had another drive around to use as a kind of scratch disk. I am also trying to figure out the best way to edit a much more complicated music video without having the audio constantly fall out of sync. I am not sure the older Final Cut would offer much advantage here though (the nature of the project precludes the use of multicam). I also wish the colour correction tool offered s-curves like those found Aperture. I find the current tool to be imprecise and clunky compared to colour correcting in Aperture or Lightroom, but It is still a vast improvement on what Final Cut Express offered. This product has been been met with widespread derision from film professionals and experts. Film pros have legitimate reasons to be upset; the new software is missing many critical features essential to a professional environment (these missing features and problems are well documented here, here, here, and in the comment section of David Pogue's follow up review). It should be noted that Apple has promised to add many of these features back in over time. In the meantime, Apple is issuing refunds to unhappy customers (via EOSHD). Apple has also discontinued the old, much loved, version of the software that form a critical piece of the workflow for many organizations. This is the move that I think is most worrisome for these organizations; they can no longer go out and buy new copies of the program for updated workstations. There is no supported way forward for their workflows as a stopgap until Final Cut Pro X is feature complete. 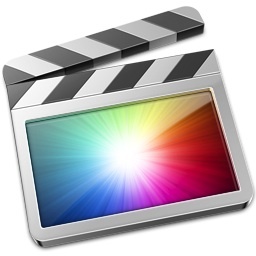 If Apple cares about the professional market (a big assumption), they could create a lot of good will by selling copies of Final Cut 7 price matched to the current version of Final Cut Pro X (a price drop from $1000 to $300) until Final Cut Pro X is up to speed. Some of the reaction around Final Cut Pro X has bordered on hysteria though. People complaining about starting a project in an older version of Final Cut Pro and not being able to finish it in the new program are anything but professionals. A professional does not switch editing suites and make drastic changes to their workflow just because a newer, shiner, product comes out. Don't switch horses midstream. This advice is as true today as it was in Lincoln's time. Apple's tagline for Final Cut Pro X is "Everything just changed in post". This is certainly true for me. Final Cut Pro X feels more powerful and accessible to me than FCP7 or FC Express ever did to me even though it is missing key high end features. This is a key theme of all of Apple's products—first make the features that are used 90% of the time as simple and intuitive as possible, then add in the extra functionality over time. This drives power users nuts, but makes things infinitely more useable for the rest of us. Too many companies waste their time on the 10% of features that only a small fraction of their potential users care about. Apple did this with iMovie 08 when they released a stripped down and simplified video editor that replaced the much loved iMovie 06. Power users hated the new version (rightfully so) as many of the features they had come to depend on were stripped away. But iMovie 08 opened up video editing too many more people (including myself). It coincided with the popularization of the Flip class of cameras that made shooting video cheap and simple (my first camera was a Flip Mino HD). iMovie 08 made it simple and fun to cut together footage, add basic effects and text, and produce decent looking video clips to share online. Most new people using iMovie 08 didn't care about tape ingest, multiple track, and the extensive plugin support of iMoive 06. They just wanted to share videos on Youtube. I remember the thrill when my Flip arrived in December 2008. I shot a few clips of Jaime walking through a blizzard to a restaurant to pick up some take out. Within an hour I had finished editing a short montage set to music. Despite its roughness it is still one of my favourite movies. The much steeper learning curve of iMovie 06 would have never let me do this. The central conceit of the iPad is that it’s a portable computer that does less — and because it does less, what it does do, it does better, more simply, and more elegantly. I remember handing my iPad to my parents for the first time. It was the first computer they were not scared of. Within minutes they were surfing the web and watching videos on Youtube. When I came back twenty minutes later and my mom had found Sketchbook Pro and made a little drawing. The iPad doesn't have nearly as many features as their regular computer, but it is so much simpler to use that they end up doing far more with it. Now that my parents have iPhones they use them far more than their computers despite the smaller screens and touch keyboards. This is something most power users don't understand. It isn't about features and checkboxes. It is about usability for the most people. Just as the flip cameras revolutionized the low end of the video market, DSLRs are changing the high end. Most big budget movies won't be shot exclusively on DSLRs (yet), but many smaller features, commercials, and indie films are. Final Cut Pro X is for these people and what Apple sees the future of film making to be. Skate to where the puck will be, not where it is. So if you’re really a professional you shouldn’t want to be reliant on software from a company like Apple. Because your heart will be broken. Because they’re not reliant on you. Use Apple’s tools to take you as far as they can – they’re an incredible bargain in terms of price-performance. But once you’re ready to move up to the next level, find yourself a software provider whose life-blood flows only as long as they keep their professional customers happy. When it comes down to it, Final Cut Pro X isn’t about alienating professionals: It’s about finding out just what a “professional” looks like in this day and age. That line has blurred tremendously in the last decade thanks to widely-available—and inexpensive!—personal technology. Filmmakers are putting together features for $11,000. TV crews have gone digital; and that’s not even covering the amount of video created every day on the Web. Apple doesn't care about the high end entrenched professionals, they care about the rest of us. UPDATE: Apple has released this FAQ about missing features and a rough timeline for when things will be included. Looks like Multicam support will be in the next major update.